The Legend of Zelda: Skyward Sword is part of the 25 year old fantasy plot series that follows protagonist Link to pursue the exotic and forever appearance altering Princess Zelda. What however makes this game different from the long continuous series of games released under this brand name is that the gamer can get more involved in finding the virtual princess beauty. We are now in the setting that prequels the events of "The Legend of Zelda: Ocarina of Time". Link the main protagonist of the series is shown in a new incarnation born in the islands of Skyloft that hover over the clouds. He lives his life there, like any normal (in context) native until when he discovers the Skyward Sword. Upon the discovery, he is transported to a mysterious land that is ruled by evil powers. Link uses the sword as a portal to travel to and fro between the mysterious land and the sky. As the plot progresses, Link understands the reasons for the separation of the Land and the sky. Eventually at some point of the game, the Skyward Sword becomes the powerful Master Sword which literally takes the form of a female who gives Link advice. The basic objective of the game is for Link to find Zelda who unlike in the previous is not a Princess but rather a childhood friend of Link. Although motion sensing is the trademark feature of the Nintendo Wii, it's sensitivity is very limited and predetermined. Move your Wii Remote left, right, up, down, diagonal, or even the shape of a heart, the game character would perhaps perform only one of the default moves that it can do. The Wii Motion Plus changes that, and which is why playing Legend of Zelda: Skyward Sword will simply be an 'awesome' experience. 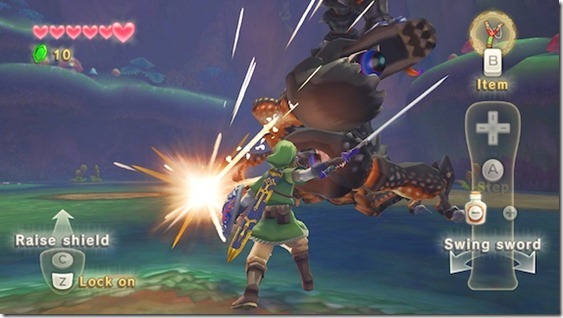 The sword play which is one of the most important weapons in Link's arsenal of weapons is enhanced such that the motion of player is synchronized with exact precision with the motions of Link with the sword. With this extra-sensitive feature, the game developers have created enemies accordingly. Battling the enemy will now require a bit of the gamers' own strategy to fight. Motion plus technology. With this technology, the player can now fire bows with the exact aim of the gamer and throw bombs and use the whip. Thus Nintendo's The Legend Zelda: Skyward Sword continues the remarkable story of Link and Zelda but this time offering a chance to really step into their world with the Wii Motion Plus acting as the connection between the gamer operated world and the world with the gamer present in it. Indeed in reality the Wii Motion Plus is the Skyward Sword of the gamer, and the portal between the real world and the virtual fantastical universe.